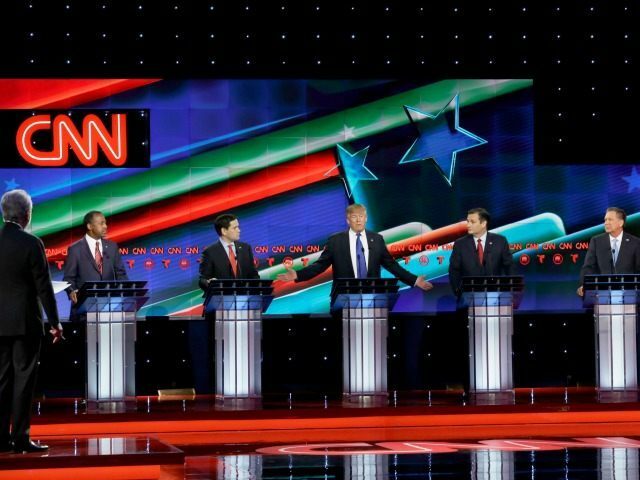 The last GOP debate before Super Tuesday is in the can. Co-hosted by CNN and Telemundo, it was viewed by 14.5 million people on Thursday evening. The debate crystallized that this is now essentially a three-person show: Donald Trump, Sen. Ted Cruz (R-TX), Sen. Marco Rubio (R-FL). And things really got hot, as the gloves came off. It was painfully clear (to me, anyway) that Trump exposed himself as being all temperament and style, and not very much substance. But given the distrust and discontent of much of the GOP primary electorate I’ll be interested to see if Trump’s inability to get into specifics causes him more trouble than his decades of ideological inconsistency. Going in, Trump was advantaged: Vicente Fox, former president of Mexico attacked him, and Biden, in Mexico, apologized for Trump. Some of the attacks in the debate on Trump were potent, but will they work this late? The longer voter support for him consolidates, the harder to disabuse Trump voters. Carson was much improved, but CNN cheated him on time. Kasich did fine and is the only one of this group that Trump, if he were the nominee, could consider as VP. Rubio probably ruled himself out. Rubio and Cruz did well, Rubio probably better. If the repeated doubts about Trump raised by Rubio and Cruz did not work last night, they won’t work at all. The debaters have all improved their verbal-combat skills (thank heavens! ), and how to handle the moderators (even better!). Sadly, we learned (again) that Kasich’s dad was a mailman and Carson doesn’t get to answer too many questions. Rubio was a home run, Cruz was very effective and Trump was typical — he repeated himself with little substance. However entertaining he may be, I think we saw a lack of depth on issues. I Watched the debate/dogfight with the two Junior senators, Ted Cruz and Marco Rubio desperately and ferociously attacking the front-runner, businessman Donald Trump. Mr. Trump held his own. Certainly neither one of the senators can claim the title of Mr. Congeniality. Sen. Rubio, with his boyish look, was funny when he said that if Mr. Trump had not inherited his wealth (actually he borrowed money from his Dad) he would be selling watches in Manhattan. Probably so, but it would be his own label and most likely at Tiffany’s, I Magnin, or Cartier! I don’t think Sen. Cruz scored any points last night — he was combative, unconvincing, repetitive, and closing the IRS is not going to happen. Dr. Carson once again proved he is a classy gentleman, his hands are magic and they have saved lives. Gov. Kasich, perhaps the one of the five with the most knowledge and experience in government, was calm, and had very had good answers. Overall, nothing new about their stances on immigration, ISIS, North Korea, Russia, Iran, IRS. vs. Apple. No losers, but Mr. Trump continued being himself–though more subdued– and stood his ground, stronger, giving him the advantage to go on as the frontrunner to win several states on Super Tuesday. Not only did Marco land a series of never ending punches, he enjoyed it. The Donald is bruised. It will feel the pain today. Cruz was the winner overall. He let Rubio attack Trump while reserving his time for principled answers. He needed to win on home turf and will now do well in Texas. Rubio landed punches but failed to make a case for himself and was constantly interrupting. He needs to convince voters he is mature enough for the job, and his impatience signals the opposite. Trump had his worst debate, though not catastrophic. But Trump is the long-term winner because Rubio’s supporters will think he did well by attacking, thereby keeping him in the race and continuing to split the anti-Trump vote with Cruz. Tonight, we finally had a winnowed field that showed that Trump was unprepared on policy issues to be president. The only thing he could say about fixing Obamacare was the Republican doctrine of at least 15 years of a national health insurance market. He lied about his taxes. The IRS can only go back three years on an audit, but Trump is supposedly being audited for 4-5 years. If he is being audited every year, there goes his mantra of hiring the best people. (He should call me and I would make sure he never gets audited again.) There is no reason he cannot release his tax returns because of these supposed audits. Kasich and Carson were window dressing. Rubio decked Trump and won the debate. Trump lost the debate badly. Donald Trump is as phony as Arnold Schwarzenegger! His petulant name-calling and New York rudeness is already getting tiresome, but the primaries just started. Ben Carson had the best line of the debate: “Will someone please attack me?” Senator Ted Cruz, the CRA-endorsed candidate, stood out as the only candidate who looked presidential and really meant what he said. How do people take Trump seriously? I mean, c’mon, this guy is so ahead of his skis, he doesn’t even know what he’s talking about. Rubio put him on his heels repeatedly and even when Trump struck back, Marco pounced on him. Was Carson there? Did tonight’s debate slow Trump’s march to the nomination? No, it didn’t. Though Cruz and Rubio surely landed some punches, Trump, again at ground zero center stage, and battling away, seemed to be able to come back cooly whenever he needed to. He made good sense on his tax cut plan, spending, and the “Wall”. His saying he will “not let people die on the streets” will be seen as offering some compassion, not socialism, by most voters. Kasich seemed to benefit from more time than usual in past debates, and Carson, sadly, is just increasingly irrelevant. Cruz debating Trump as if they’re on Senate floor = losing. Rubio’s street fighting = winning. Rubio comes out swinging from the start and Trump fantasizes that Hispanics love him. This debate was a sh*t show. Rubio did what he needed to do but not sure it’s enough to change the dynamic before Tuesday. Carson should take his fruit salad and go home. Jon Fleischman is the Politics Editor of Breitbart California. A longtime participant, observer and chronicler of California politics, Jon is also the publisher at www.flashreport.org. His column appears weekly on this page. You can reach Jon at jon@flashreport.org.